Sheepherders in the mountains of the West for generations have spent months in remote areas, far from their native countries, tending to sheep, and missing home. 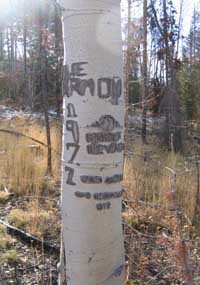 Many aspen trees in the hills around the Wood River Valley are marked with mementos left by those sheepherders. The tree carvings, known as arborglyphs, contain names, initials and drawings made by herders who often immigrated to the U.S. with their families. Many sheepherders came to Idaho in the late 19th century from the Basque country in northern Spain. Herders today tend to hail from Peru and Chile. In some parts of the West, Irish herders left their marks. Chris Worrell, writing in Legacy Magazine, says arborglyphs are a time-honored tradition that spans thousands of years, providing an ephemeral historical account of those working and living close to nature. “Cherokee Indians are known for being the creators of countless tree carvings in the Southeast, particularly during the period in which Native Americans were forced west along the Trail of Tears,” Worrell wrote. His story states that historical figures who created glyphs include Henry David Thoreau, Kit Carson, Ronald Reagan and William Clark, while arborglyphs have been documented by Ansel Adams, 18th-century Moravian missionaries and the Roman poet Virgil. “Such tree carvings exist at the juncture of nature and history, thereby affording nearly limitless opportunities for interpretation,” Worrell wrote. Many Basque herders in Idaho left markings that contain historical significance for researchers, including John Bieter, the executive director of the Cenarrusa Center for Basque Studies at Boise State University. Beiter took a field trip with BSU students to the Sun Valley area last August to make plaster casts of arborglyphs in the area, to be preserved in a database contained by the Boise National Forest. Beiter is Basque, as is his brother Dave Beiter, the mayor of Boise. He told Fox News in 2006 that arborglyphs sometimes contain political slogans such as “Gora ETA,” a phrase that supported an armed Basque separatist group active under the dictatorship of Francisco Franco. “He could carve it into a tree in Idaho, but if he said it in Spain, he’d be imprisoned,” Bieter told Fox News. Bieter said he also has noticed explicit pictures and sexual themes in the tree carvings. Many of the older arborglyphs are surely gone by now, as the average life span of an aspen tree is 80 years, but some have been preserved in photographs. “Immigrant Shadows: Tracing the Herders’ Legacy,” a current exhibition celebrating arborglyphs, will be open through the end of the Trailing of the Sheep Festival on Oct. 14. The exhibition takes place at the Ketchum Sun Valley Ski and Heritage Museum in Forest Service Park. Call 726-8118 or visit www.ksvhs.com. Adults, $5, children free. On Sunday from 2-3:30 p.m., a Sheepherder Walk will take place to view carved aspens. See Calendar, page 4, for details.